31/10/2006 OUT OF PRINT AND WON'T BE REPRINTED. 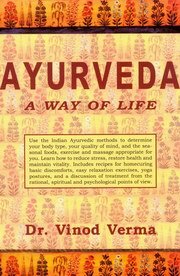 "Ayurveda : A Way of Life is an easy-to-understand, comprehensive guide for assimilating the fundamentals of Ayurveda—India's ancient life science and system of holistic health care—into our modern, daily lives. Most people are familiar with the three-humor constitutional types that form the basis for Ayurvedic treatment. This book is uniquely important because the constitutional types—and their combinations—are clearly explained so readers can create their own balance. "Dr. Vinod Verma received a Ph.D. in Reproduction Biology from the Panjab University in India and a Ph.D. in Neurobiology from the University of Paris. She went on to do advanced research at the National Institutes of Health in Bethesda, Maryland and the Max-Planck Institute in Freiburg, Germany. At the height of her career as a medical researcher, Dr. Verma came to realize that the modern approach to health care is non-holistic, and that more attention is often directed to curing the disease rather than maintaining proper health. As a response to this lack of attention to the conservation of the health of individuals, Dr. Verma founded NOW, the New Way Health organization currently housed at the Noida Center near Delhi, India.